A gradual change is occurring in the heavens above. This change occurs every day, it's just so minute that most of us never even notice. This shift of the starry curtain became official with the change of seasons; summer gives way to autumn on the Autumnal equinox (around September 21). The air will become cooler, leaves are changing color, but the stars of summer linger on for just a little while longer. After dusk in early October go out and look to the top of the sky. You'll see three bright stars forming the Summer Triangle, the seasons' dominant asterism. The brightest star, at the upper right as you face south, is Vega, which is part of the constellation Lyra "the Lyre." Vega is a white hot star located 26 light-years away. From Vega, direct your eyes slowly to the east. The first bright star you'll find is Deneb, the second corner of the Triangle and the tail of Cygnus "the Swan." Cygnus is also known as the Northern Cross. Looking down to the south you'll find Altair, the last star of the Triangle. Altair is part of the head of Aquila "the Eagle." It takes a little more practice and imagination to see the eagle. If you view the Summer Triangle from a dark location in the country you'll notice a peculiar glow. This pearl gray light is caused by uncounted distant stars in our Milky Way Galaxy. If your skies are truly dark you should be able to trace the entire summer portion of the Milky Way. Begin in the northeast, near the "W-shaped" constellation Cassiopeia and move toward the top of the sky to the Summer Triangle. Now move toward the southwest where you may come across the constellation Sagittarius if your horizon is free of trees. Say goodbye to these stars of summer! They set in the west an average of four minutes earlier each night. This shift in the stars is caused by the orbit of Earth around the Sun. It's like having a window in each wall of a four corner house. As you look out each window, you're greeted with a new view of the space beyond. The shift of the sky from summer to autumn is special. Our view turns away from the Milky Way Galaxy to deep space. No longer are we treated to views of the star clusters and glowing clouds of gas that populate our Galaxy. Autumn is a season of galaxies. Before we attempt to locate a galaxy, let's find two prominent constellations of autumn. The first one is easy. In early October the constellation of Pegasus "the Winged Horse" is due south at 11:30 pm. To find Pegasus first look for the Great Square. That's right! In the summer we have a triangle and in the autumn we have a square. The stars of the Great Square aren't as brilliant as the stars of the Summer Triangle, but it's still an easy pattern to identify. Three stars of the square form part of Pegasus. The northeast star of the Great Square is the head of Andromeda, the daughter of King Cepheus and Queen Cassiopeia. Andromeda appears as two arcs of stars that meet at the star Alpheratz, which is the head of Andromeda. A very special object lies in Andromeda. Once the evening sky is Moon (and cloud) free go out and locate Andromeda. Start with your unaided eye, but be sure to grab a pair of binoculars. Start from Alpheratz and follow the upper arc of stars. Move two stars from Alpheratz and then take a hard look just to the north of this star. What you're looking for is a faint patch of light. It almost looks like a detached part of the Milky Way. This couldn't be further from the truth. That faint patch of light is the Andromeda Galaxy, an "island universe" located 2.5 million light-years away. It's the most distant object we can see with our unaided eye. The Andromeda Galaxy is a spiral galaxy like our own. Its diameter is estimated to be 150,000 light-years, which is 50,000 light-years greater than our Galaxy. It also contains more stars. The Milky Way contains an estimated 100-150 billion stars, while Andromeda may contain 200-300 billion or more stars! Truly our big sister in space! 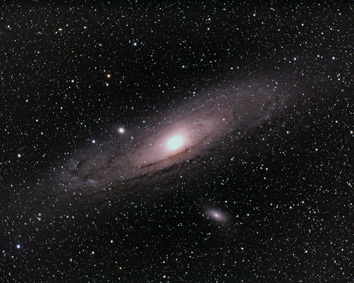 Despite its great distance from us, the Andromeda Galaxy appears 3 degrees across in our sky at its fullest extent. This is 6 times the diameter of the Full Moon!